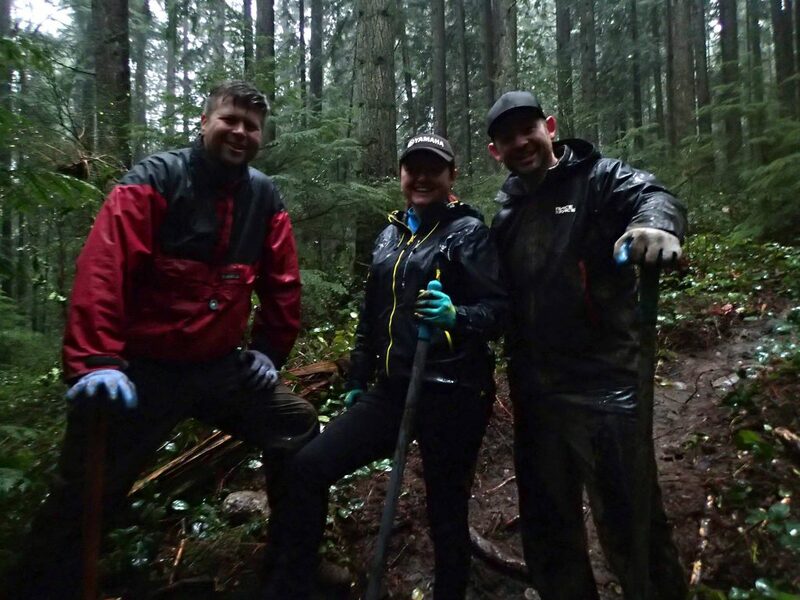 The NSMBA has 28 trail builders that care for the networks on Fromme and Seymour. 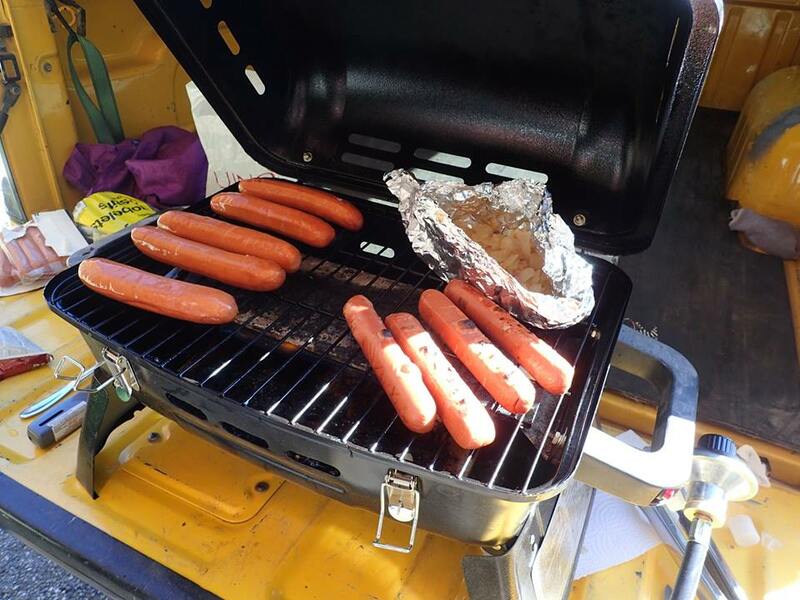 In 2018 they led over 130 trail days as well as volunteering many hours clearing drains, rebuilding woodwork, patching up holes, and all of the other tasks needed to keep the trails in tip top shape. 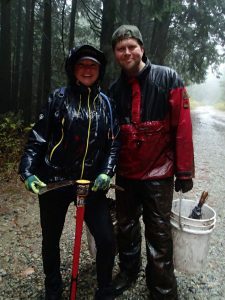 Continuing our introductions to these Trail Heroes, this month meet Sarah and Sean, whose hard work on the lower network on the west side of Fromme helps keep you smiling as your wheels hug the berms of Lower Expresso or your bike navigates the twists and turns of Pennzoil. You might also see them at a Fiver, helping racers tap in or out, always with a smile, and often in costumes with music to get you pumped. Thank you Sarah and Sean for your dedication to our community! How long have you been riding? Building? Sarah: Bicycles: since I was 4 years old (I’m not admitting to how many years I’ve been at it! ), Mountain bikes: 9 years, Building 5 years. 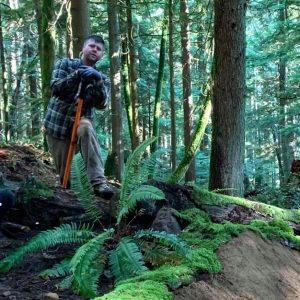 How did you get into trail building (that project)? Sean: Started riding on the North Shore and the trails were pretty extreme and clapped out. When I heard about the trail days I jumped at the chance to help fix the trails up. Believe the first trail day I attended was part of the Bobsled re-route. I made some friends and started building up the Karma bank, now building is as much fun as riding, it’s a great creative outlet. Sarah: One place??? Nope, I cant decide!! But here are a few that are memorable… Cwm Raeadr, Wales. Cannock Chase, Silverstar and Coast Gravity Park…..
Sean: Cwm Rhaeadr Forest Trail Centre in Wales. What trail building feature or project are you most proud to have worked on? 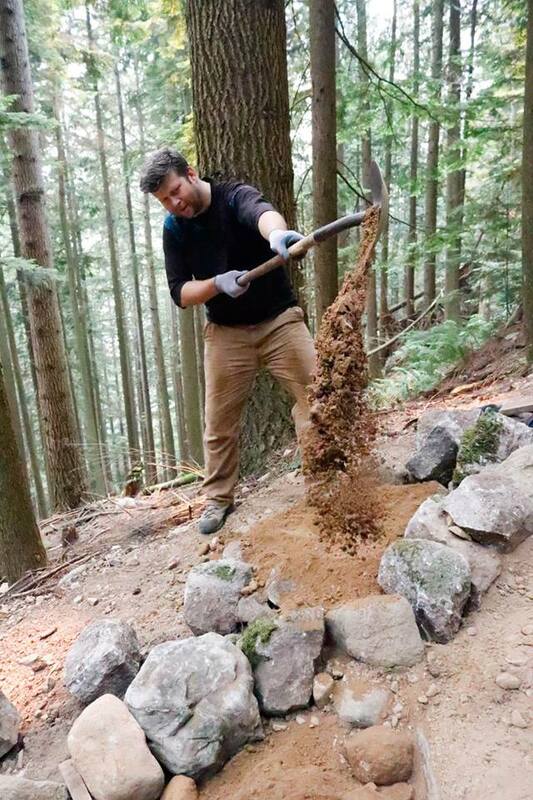 Sean: I’ve enjoyed working on the Baden Powell trail. It’s a multi use trail and as a previous Boy Scout it has a lot of significance for me. What’s one thing you’d like to see in in the future of the North Shore trail network? 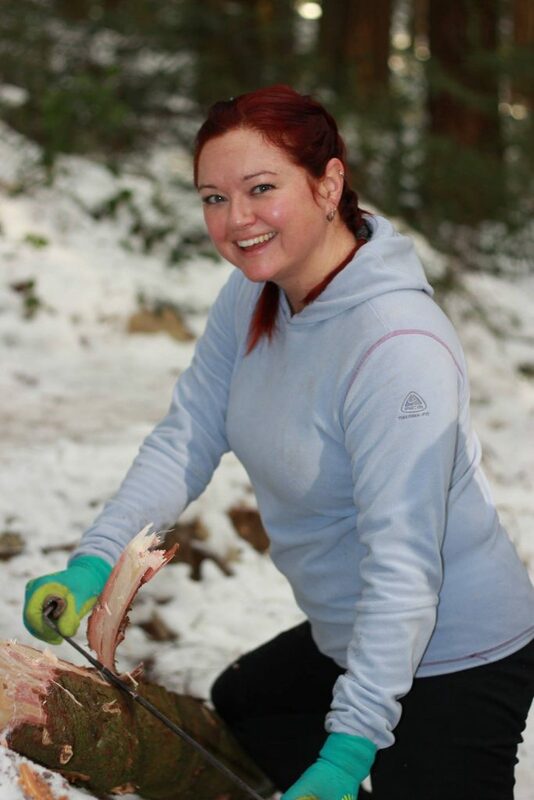 Sarah: More of a consistent skill-level grading system and a progressive trail system. We are well on our way! 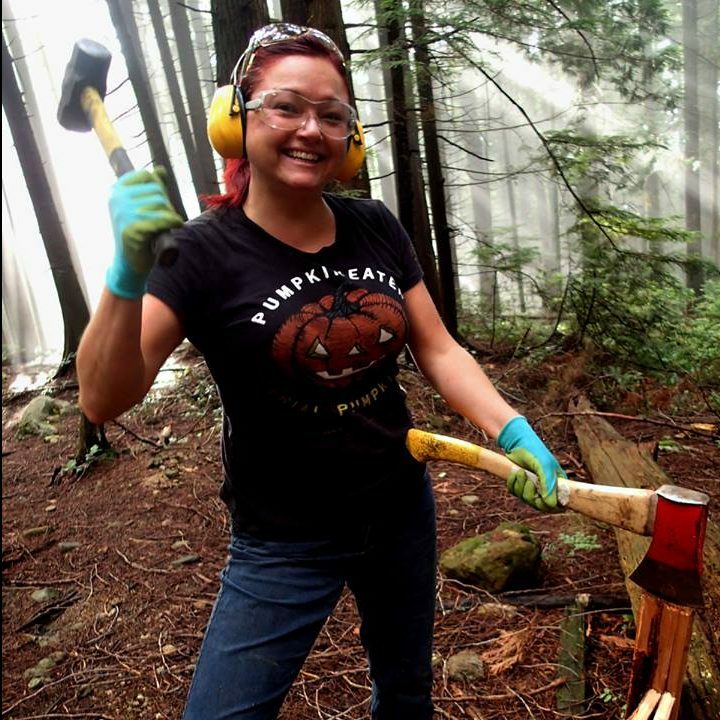 What’s your favourite trail building tool? And why in three words or less. After “have fun”, what’s the best piece of advice to people riding trails? Sarah: Maximum fun is had when at the end of a ride there are no injuries and just lots of high fives!! Sean: Be in the moment, appreciate that you have the time and good health to ride bikes in a lovely place. What’s your favourite trail building catch phrase? Sarah and Sean: 10 More Buckets!!! 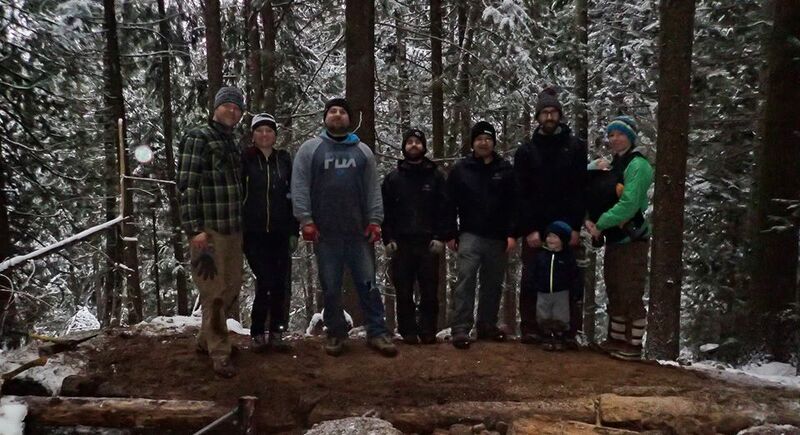 What’s the most rewarding aspect of trail building? Sean: Seeing other people have a great time on something you’ve built. Sarah: Seeing the difference before and after. Also while working on the trails; the gratitude of the vast majority of riders coming through! What’s the most frustrating aspect of trail building? Sarah: Having a day job and not being able to get up into the trails more! Sean: Same. Having to work for a living and not being able to do it full time.